City Hall today played host to children from six London schools seeking essential funding for their community projects as part of our City Pitch programme. City Pitch encourages and helps young Londoners to step up as leaders, learn new skills and make a real difference in their communities and today’s event saw them deliver presentations to a panel of expert judges, in a Dragon’s Den-style event to secure £1,500 funding to help launch and run their projects. 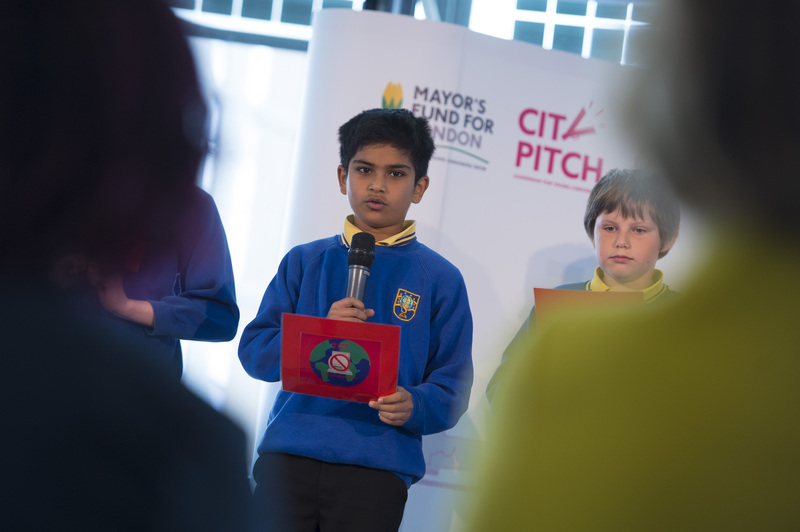 The six schools reached today’s City Pitch finals after being chosen from dozens of the capital’s schools earlier in the year. The school teams each delivered a 10-minute presentation to the judges in front of fellow pupils, teachers, the media and other City Hall dignitaries. ‘Stop Smoking’ by Argyle Primary School, Camden – Pupils at Argyle Primary School want to help their community be healthier and cleaner by running a campaign to encourage teenagers to stop smoking. ‘Rad Road Rangers’ by Elmhurst Primary School, Forest Gate – Demolish dangerous driving and save lives! Elmhurst Primary School aims to launch a road safety awareness campaign by creating a memorable video to share online and through their local council. ‘The Green Team’ by Ferry Lane Primary School, Tottenham Hale – Ferry Lane Primary School pupils would like to hold a river clean up and launch a campaign to help prevent pollution and protect local wildlife. ‘Tooting Community Time’ by Sellincourt Primary, Tooting -It’s time to get off technology and get outside! Sellincourt Primary School pupils want to stage ‘phenomenal’ family events in Tooting utilising local areas such as the library and Tooting Common. ‘Road to a Healthier Mind’ by Rhyl Primary School, Belsize Park – Rhyl Primary School pupils plan to promote mental and physical health in their school community with meditation and yoga sessions for young people. ‘Families in Need’ – New North Academy, Islington – Pupils from New North Academy plan to partner with their local food bank to provide essential items for families living in poverty, such as school uniform and children’s books. The City Pitch programme this year also incorporated a Leadership module involving even more London students, which is designed to help them prepare to be leaders in their communities and beyond once they leave school. The entire programme offers young people the chance to develop important leadership, teamwork, planning and presentational skills. Professional mentors go into schools during every stage of the programme to help the children prepare and hone their proposals and pitches. All projects must present tangible ideas to improve communities and make London an even better place to live for the next generation. This is the second City Pitch of the 2017/2018 academic year. There will be one further City Pitch project taking place next month, with further details of successful school finalists to be announced shortly.